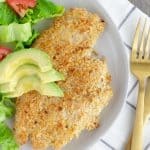 This Healthier version of Mexican Milanesa is made with lean chicken breast, gluten free panko, and baked instead of fried. My mother in law makes a pretty good chicken milanesa. She coats the chicken cutlets in ground up saltine crackers and fry’s them till golden. While delicious, it’s not exactly the healthiest. I was determined to make a version just as good, but better for you. I was excited to find Gluten Free Panko at the store and while we don’t have any allergies to gluten, it’s a nice alternative to use. But if you are gluten free, this option is perfect! Traditionally milanesa is more of a sunday supper kind of meal, since the process can be a little time consuming. However with my version, you can have dinner on the table in about 30 min. Not only is it faster, but we’re baking the milanesa all at once, so it’s healthier and faster than frying each individual cutlet. 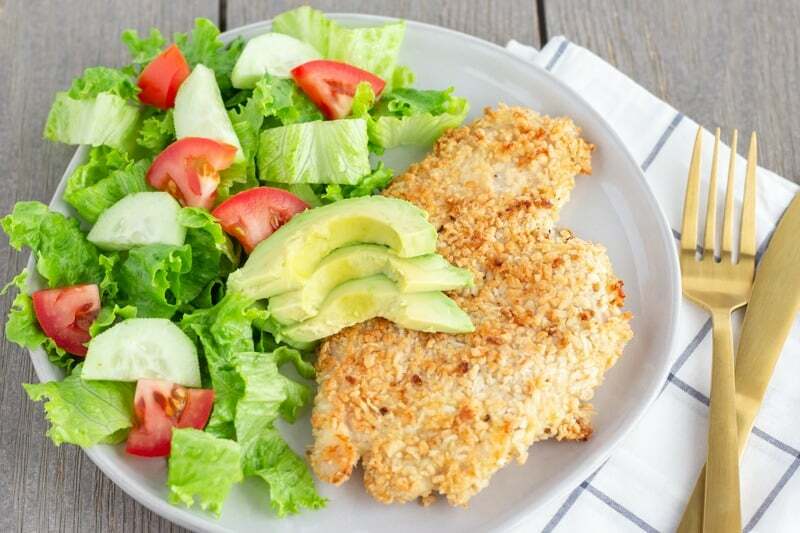 Serve the milanesa with a simple side salad and you have a quick and healthy dinner. Even my kids loved the milanesa! Start by halving your chicken breast and pound till they are all an even thickness. This will help the milanesa bake evenly and quickly. Then scramble 1 egg and pour over cutlets and move around till all pieces of chicken have been coated. 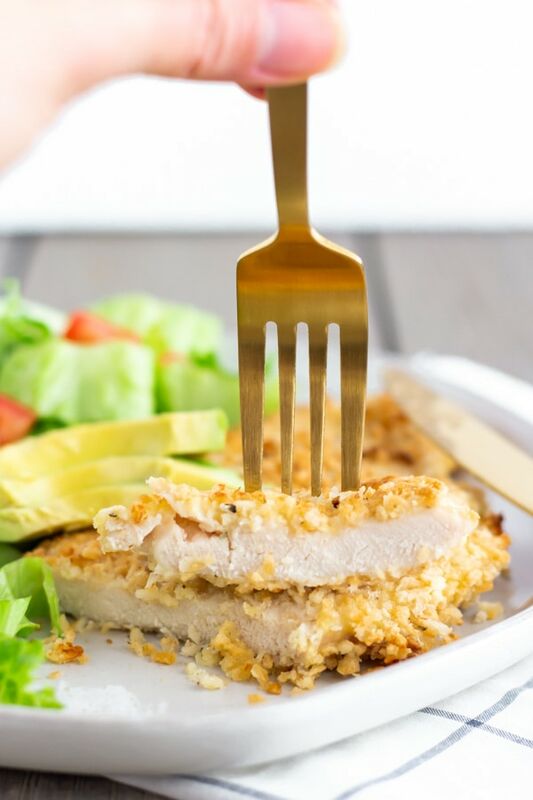 Season each cutlet with garlic salt and spoon a layer of seasoned panko bread crumbs over each cutlet. Place on a large baking sheet that’s been sprayed with cooking oil spray, and gently spray the tops of each cutlet. Bake at 415 degrees for 15 min then broil for 2 minutes till the top is slightly browned. 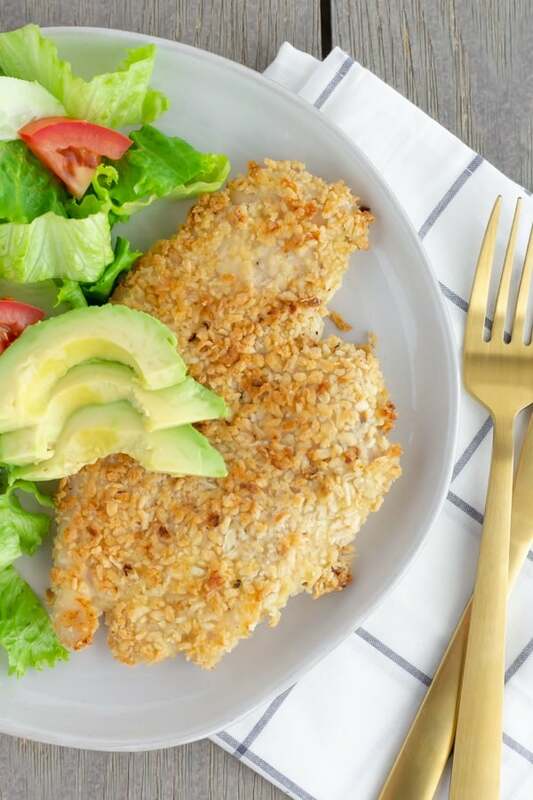 I served the milanesa with a simple side salad, avocado, and my go to dressing which consists of equal parts lime/lemon juice with avocado oil, and a dash of salt/pepper. Easy right?! But you can get as creative as you want with this dish. My Mother in law serves it with her pasta a la crema or with Mexican Rice. I’ve even seen Milanesa tortas, which is basically a sandwich. However you decide to serve it, be sure to tag me on IG @ThaiCaliente. I love seeing your recreations of my recipes! Preheat oven to 415 degrees. While oven is preheating place panko bread crumbs on a baking sheet and toast for about 5 minutes. Keep an eye on them so they don't burn. You just want a light golden color on them. Butterfly chicken breast all the way through and pound till they are all an even thickness. This will help the milanesa bake evenly and quickly. I like to place the chicken between 2 large pieces of plastic wrap and use a heavy rolling pin to pound. Scramble 1 egg and pour over cutlets on a plate and move around till all pieces of chicken have been coated. 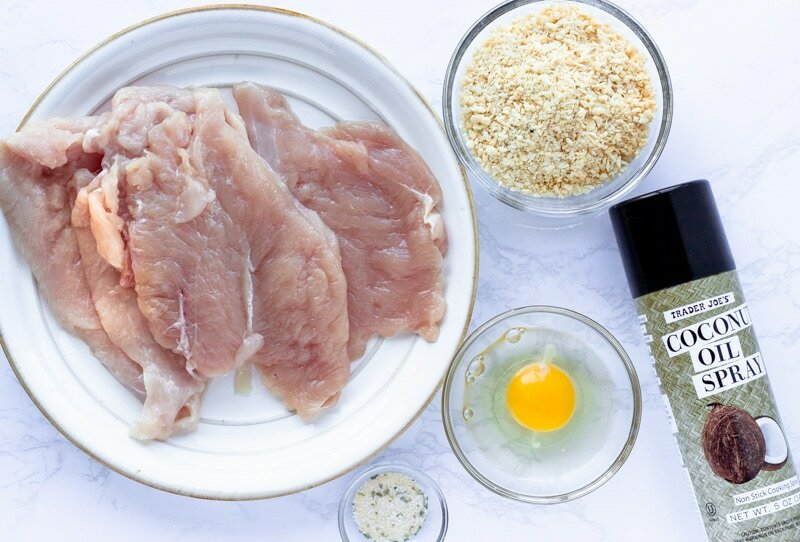 Season each cutlet with garlic salt and spoon a layer of seasoned panko bread crumbs over each cutlet. 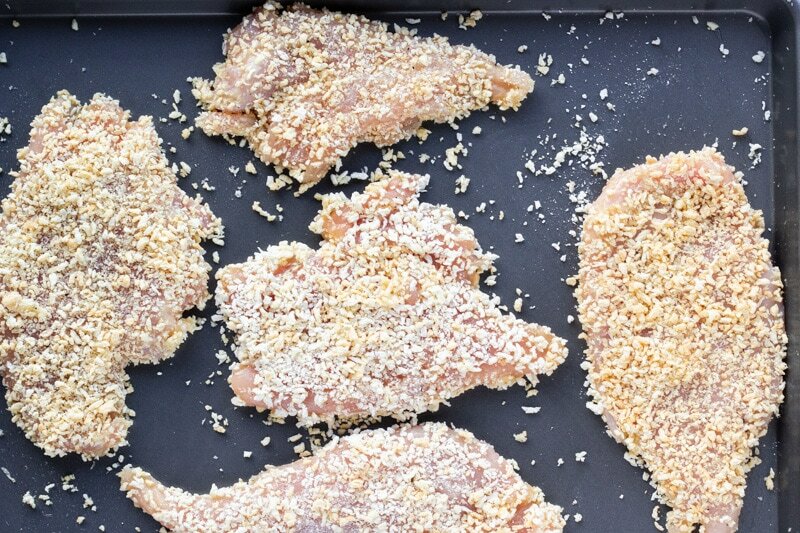 Place on a greased baking sheet and flip over to put panko on other side of chicken. Gently spray the tops of each cutlet with cooking oil. If you're too close the panko will blow away. Bake at 415 degrees for 15 min then broil for 2 minutes till the top is slightly browned.